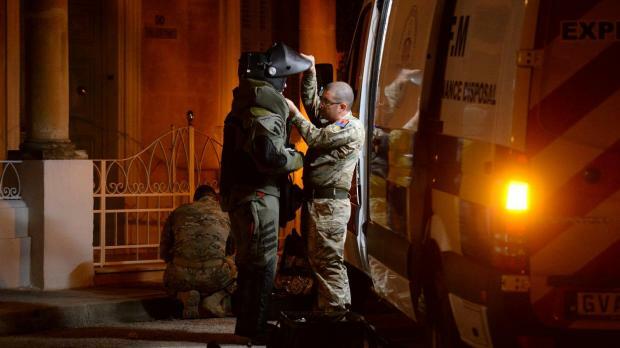 The bomb disposal unit investigates a suspicious package in Balzan which turned out to be discarded items from the robbery. Photo: Matthew Mirabelli. A court on Sunday said a "strong signal" had to be sent over immigrants who committed crimes in Malta, after a Filipino man pleaded guilty to stealing €16,000 in cash from a Balzan household where he worked as a handyman. Amadeo Montilla Manalo, 44, was charged with aggravated theft after stealing the money from his employers last Friday to fuel a gambling addiction. He was arrested after discarded items from the robbery prompted the bomb disposal unit to investigate a call about a 'suspicious package'. Leading the prosecution, Inspector Roderick Spiteri told the court the accused had cooperated throughout, had shown genuine remorse and a desire to make good for the stolen money. He has already returned €12,500 - what remained after a one-night gambling spree - and pledged to return the remaining €3,500 as soon as he could find work. Presiding over the man’s arraignment, Magistrate Joe Mifsud said the court was most concerned about the breach of trust involved and that the country had to send a strong signal against anyone coming to Malta and committing a crime against the people who employed them. Foreigners, he added, could not expect to be treated any differently to Maltese people. He said it was the court’s duty to speak out when it saw something “collapsing” in society. “I would rather he leave the country after what he has done, but if there is a chance for him to pay back what he has stolen, he should do so,” the magistrate said. Nevertheless, he acknowledged the fact that the accused had cooperated with police and added that he should receive the help he needed for his gambling problems. He also expressed concern over the man's living arrangements, as it was not clear whether he had a place to stay. “These are not people who cause problems in our country; I know many work in hospital or take care of the elderly,” the magistrate said, referring to Filipinos. In light of these issues, the magistrate said he would defer sentencing until Tuesday to allow himself time to reflect and to hear from the victims of the crime.